Jonathan Gould, Writer » Look – in the backyard. Is it a turtle? Is it a tiger? Look – in the backyard. Is it a turtle? Is it a tiger? Today is a really special day for me. Okay, I know I say that quite a bit. So let me emphasise by saying it’s not just any kind of special day. Today is a super special day. Because today marks the release of my very first picture book: Thomas and the Tiger-Turtle. All right, maybe not. But it should be a lot of fun to read (and a lot of fun to look at the pictures too). The story is really quite simple at heart. 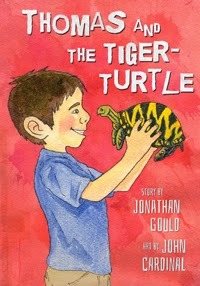 It’s about a turtle that is convinced it’s really a tiger, and about a boy who is determined to convince it otherwise. Thomas tries all sorts of ways to make the turtle see reality, including a trip to the zoo and an interesting game of tag. But when he finally achieves his goal, he finds that there’s a lot more too friendship than that. I’ve got to give a big thanks to the people at Evolved Publishing for helping this dream become a reality, and especially to John Cardinal for his colourful and fun illustrations that have brought both Thomas and the turtle to life. Hopefully you’ll have as much fun reading it as I’ve had writing it.